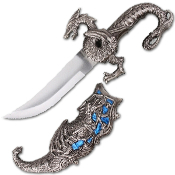 10" Blue "Dragon Slayer" Fantasy Dagger Knife - Features unique dragon guard with coordinating cast metal sheath/scabbard and handle. Inlaid faux jewels cause this dagger to seem to "glow" in the light. 10" overall length with a nice hefty 9" dagger with a 5" stainless steel blade.